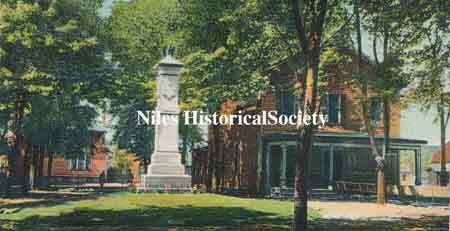 The McKinley Memorial is located in central downtown Niles, Ohio. 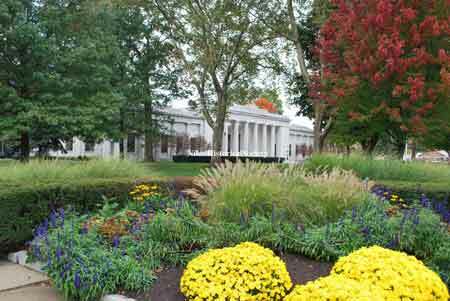 Construction of the memorial began in 1915 and the building was dedicated in 1917. 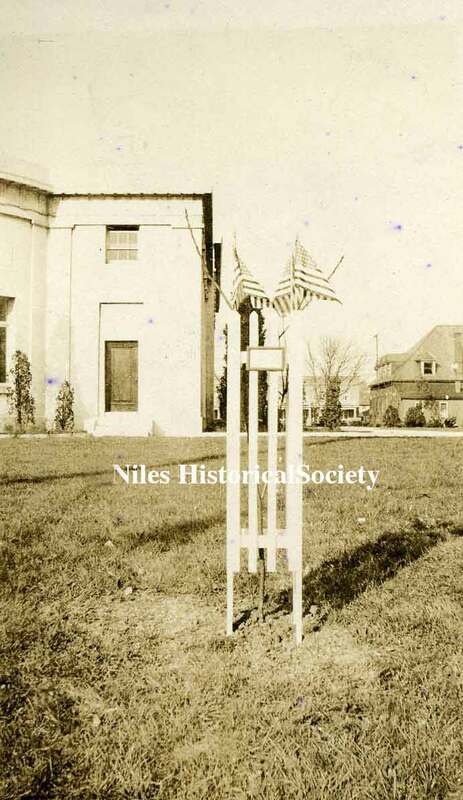 Before the McKinley Memorial was built to honor Niles' native son, William McKinley, the twenty-fifth President of the United States, a community park, Town Hall, small businesses, churches, homes and a Civil War Monument were located on this site. 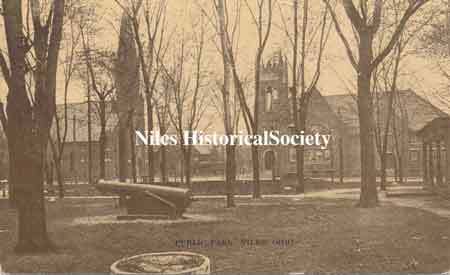 This park was referred to as 'Niles Community Park' and also 'Niles Public Park'. 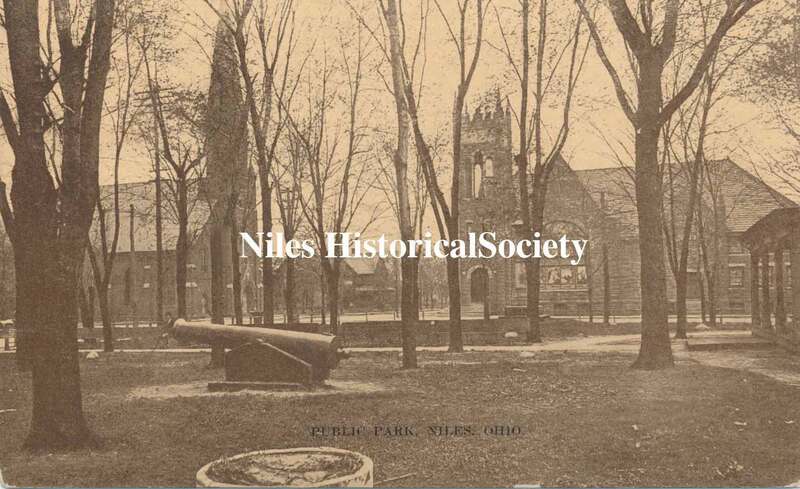 Close-up of the 1882 Panoramic map of Niles, Ohio showing the area where the future McKinley Memorial would be constructed. The church labeled 'F' was the old First presbyterian Church, in 1892 a newer church would be built on this site. The church was torn down in 1957 and the corner property was given to the McKinley Memorial Birthplace Association. 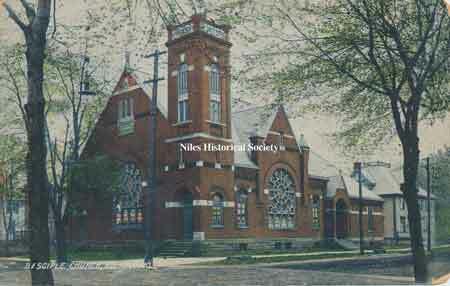 The Church of the Disciples, labeled 'A', was rebuilt in 1894 as the First Christian Church and was replaced by a new church building in 1966. 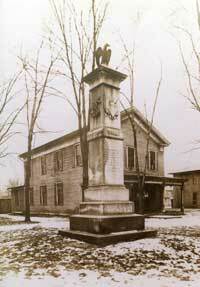 The building marked '2' was the Town Hall which was torn down prior to the construction of the McKinley memorial. 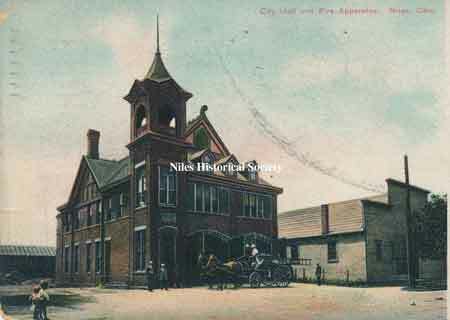 A new city building was built in 1889 on West Park Avenue and Franklin Alley which housed the fire and police departments on the first floor with the Mayor's office and city council chambers on the second floor. View of the First Presbyterian Church and houses on North Main Street. The Presbyterian Church and the First Christian Church occupied the north end of the block on Church Street. 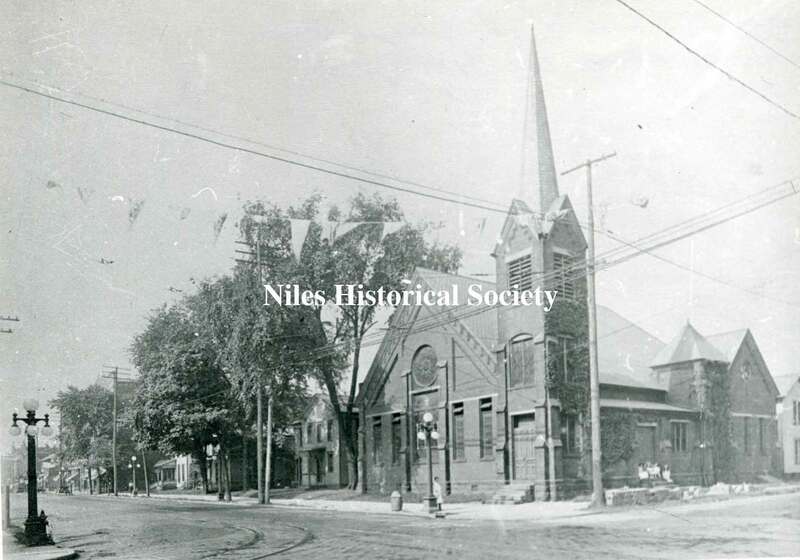 The First Presbyterian Church was demolished when a new church was built on Robbins Avenue and Crandon. This corner now stands empty. 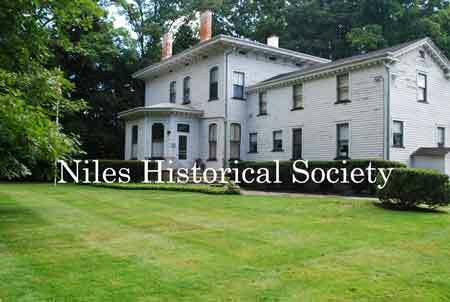 A parsonage was built in 1899 at the south end of the First Christian Church lot. The church was then demolished in 1966 when the congregation decided to build a new church on the same site. Today, this church is the only building on the McKinley Memorial block. 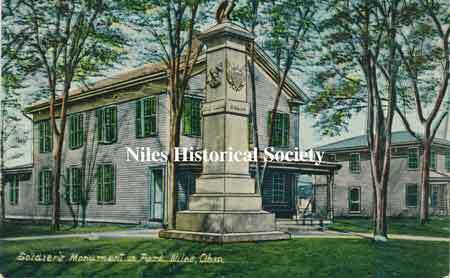 Postcard views of the Town Hall located near the center of the McKinley Memorial block and the Civil War Monument. 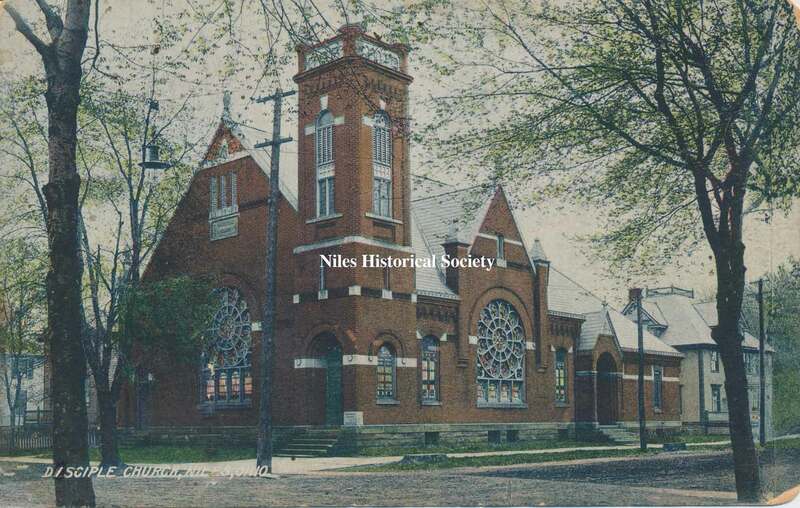 The Town Hall was demolished in 1915 to make room for the McKinley Memorial Building. 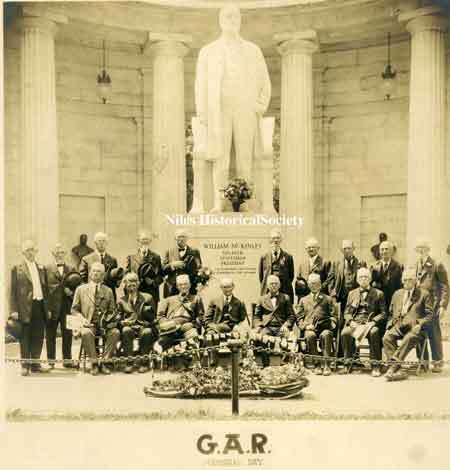 The Memorial cornerstone was placed on November 20, 1915 and the McKinley Memorial was dedicated on October 5, 1917. The new town hall on West Park Avenue housed the fire and police departments on the first floor with the Mayor's office and City Council Chambers on the second floor. The Swaney Building(1905) and the IOOF Building(1906) and the Wagstaff Building occupied the southeast corner of the block. 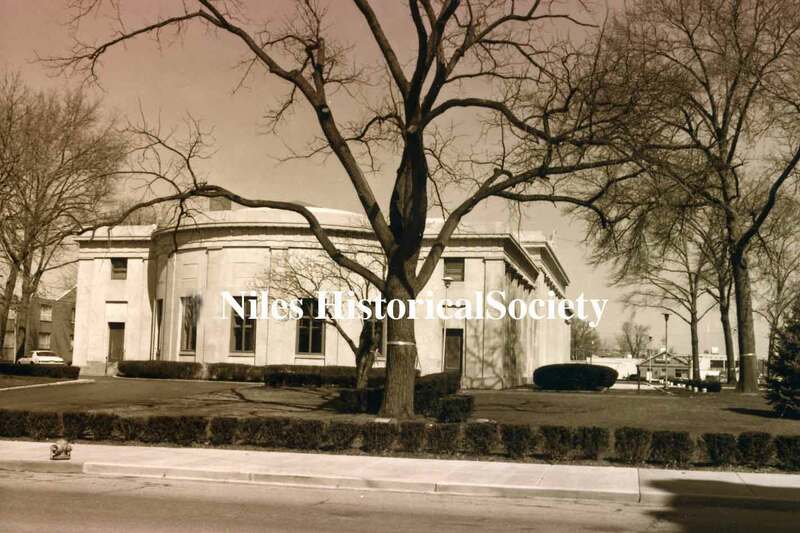 The new town hall was located on West Park Avenue opposite from its previous site in the Niles Community Park. 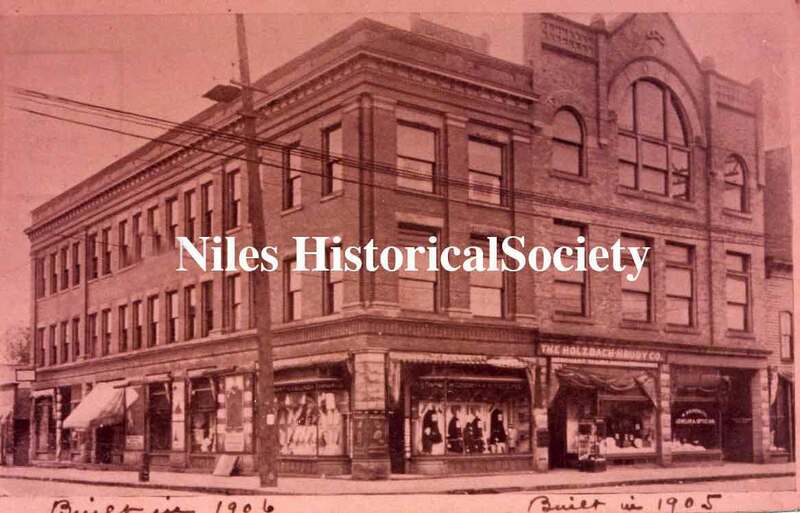 The buildings on the southeast corner housed different businesses, including Calvin's Drug Store. These buildings were demolished in the 1990s leaving only the McKinley Memorial and the First Christian Church as occupants on the grounds of the block. View of Community Park, southwest corner. The main downtown streets had brick pavers rather than dirt at this time (after 1908) and street lights illuminated the roads and sidewalks. However, transportation was still mostly by horse and buggy. The Community Park area was cordoned off with a two strand wire fence and the Civil War Monument (dedicated in 1882) is visible. The First Methodist Church is visible across Arlington Avenue (formerly Mechanic Street). This view is across Park Avenue near Franklin Alley. View of Community Park with St. Stephen and First Methodist Churches. View of Community Park looking towards St. Stephen Church taken between 1908-1915. 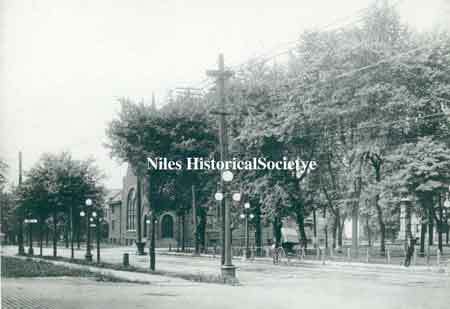 This view of the public park shows the Methodist Church on the right. 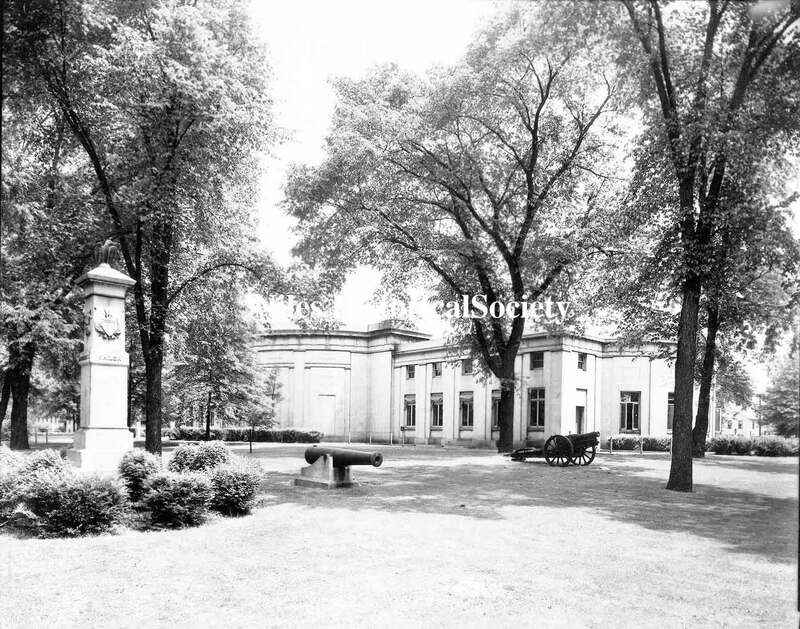 On the extreme right is the porch of the Town Hall which was demolished when the Memorial was built and the public park became part of the Memorial grounds. The McKinley Memorial was built. Memorial Day 1922, the remaining members of McPherson Post #16. On West Park Avenue, opposite the Niles Post Office and in the southwest corner of the McKinley Memorial grounds stands a tall stately Quincy granite monument honoring Major-General James Birdseye McPherson, one of the real heroes of the Battle of Atlanta, July 22, 1864. 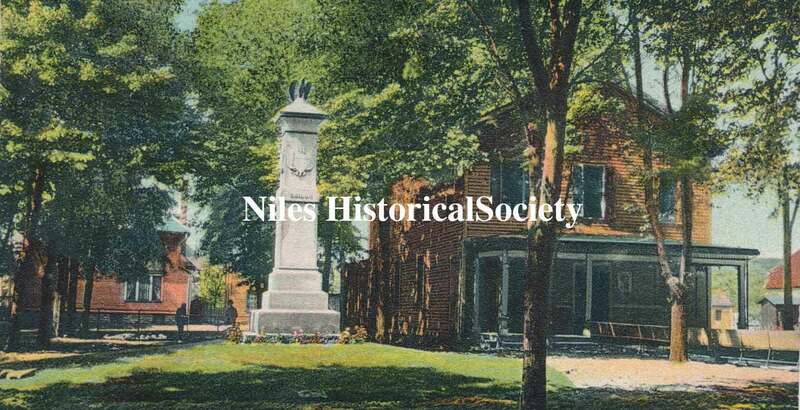 Today residents of Niles pass their Civil War monument probably not fully aware of its presence, for as long as anyone can remember, it has always been there. 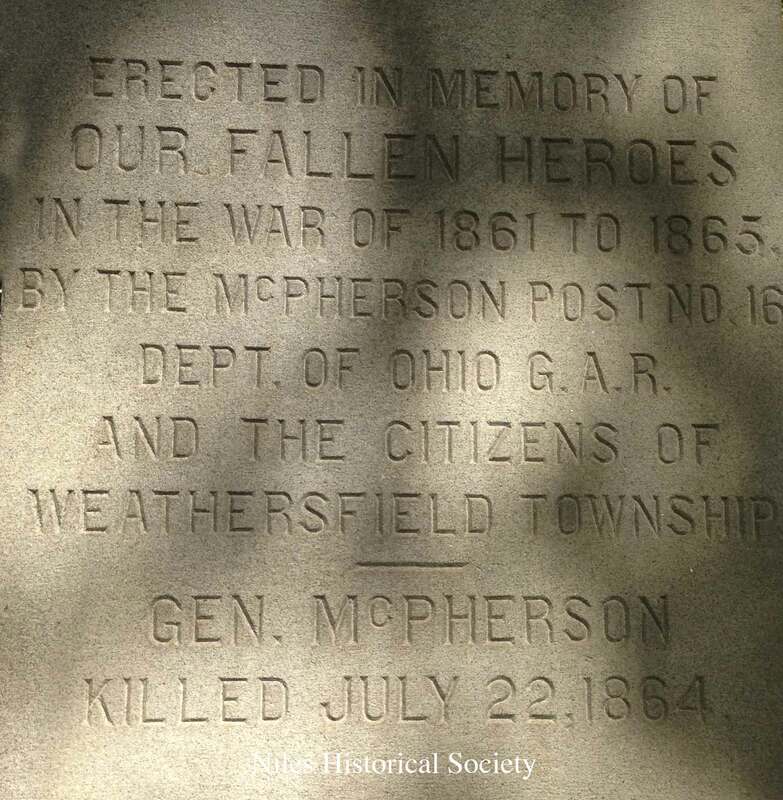 General McPherson, was the highest ranking soldier from Ohio killed in the war. General Sherman noted General McPherson’s heroic qualities in the eulogy. 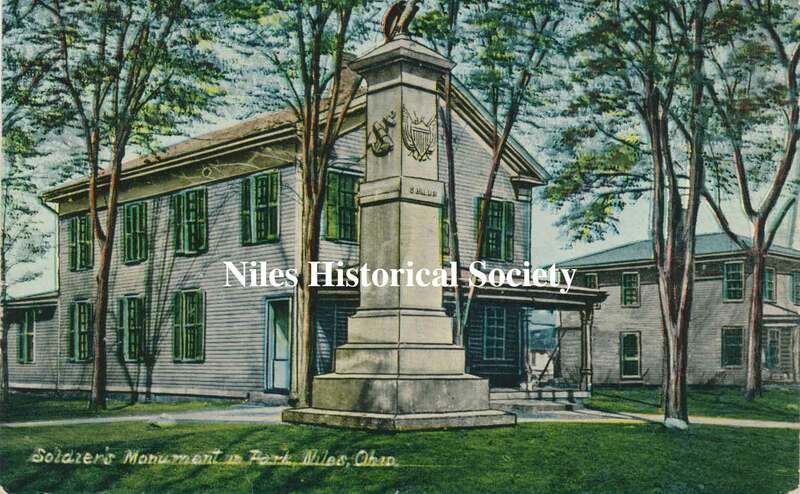 On December 24, 1878 the McPherson post #16 of the Ohio Department of the Grand Army of the Republic was organized in Niles with 30 charter members. Josiah Robbins served as their first commander. The post grew to 150 members, although there were some 250 veterans from the community who saw service during the Civil War. The purpose of this group was to instill in the minds of others the importance of a patriotic devotion to the ideals for which these veterans fought and to revere the names of those who made the supreme sacrifice. Regular meetings were held and civic affairs were always discussed. 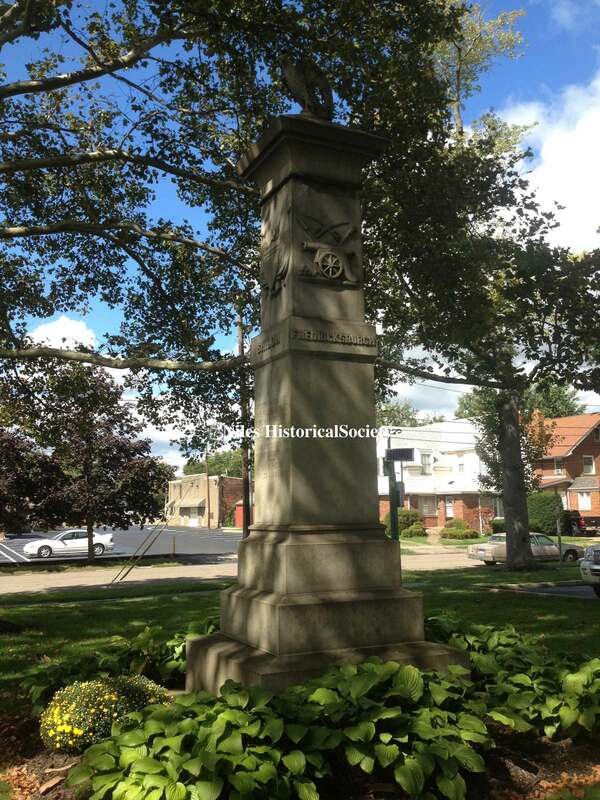 “Erected to the memory of our fallen heroes in the war of 1862- 1865. Also on each side of the main shaft, just below the war emblems, are listed one of the following four battles: Fredericksburg, Gettysburg, Look Out Mountain, and Shiloh. 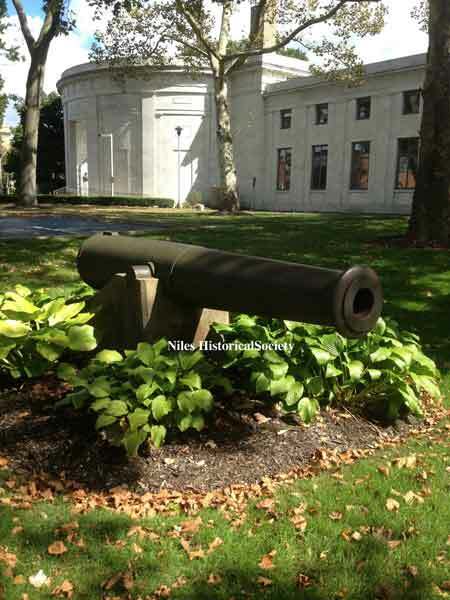 On Saturday, October 21, 1882 the monument was dedicated, starting off with the cannon being fired. A parade was formed and marched downtown, arriving at the speaker’s stand which was erected in front of the Town Hall. 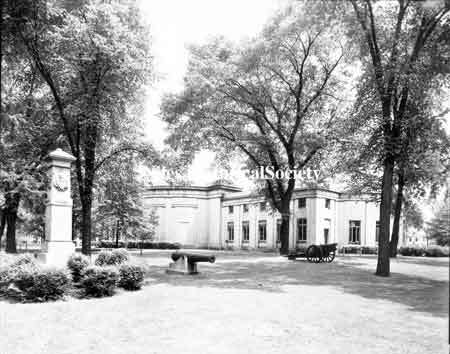 At that time the Town Hall was located on what is now known as North Arlington Street ,just west of where the McKinley Memorial now stands. 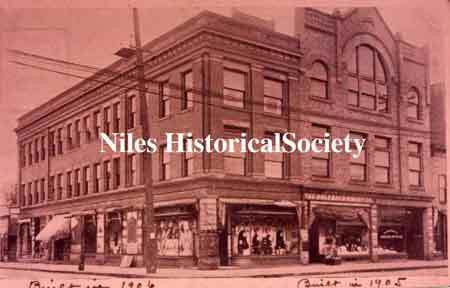 Speakers of the day were the Honorable E. B. Taylor of Warren and Honorable William McKinley from Niles. They both paid inspiring tribute to the patriotism of the private soldier as a power behind the famous generals of the army. They pointed it out that our nation owed it to her soldiers to deal generously with them, as they will never be overpaid for their sacrifices upon the battle field. The Civil War Monument Inscription. The Mt. 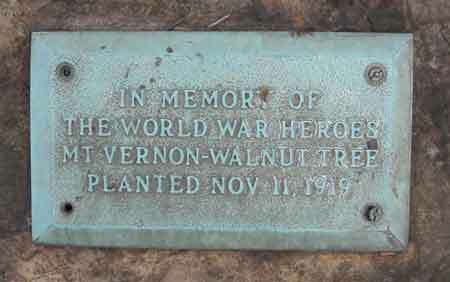 Vernon-Walnut tree was planted as tribute to those who had given their lives in the service to their country. "IN MEMORY OF THE WORLD WAR HEROES. MT.VERNON-WALNUT TREE PLANTED NOVEMBER 11, 1919." The tree was planted one year after the end of the war on the eleventh hour of the eleventh day of the eleventh month of 1918.